The thyroid is a gland that consists of two connected lobes and is situated in the neck area of dogs (and cats and humans!). The thyroid gland plays a very important role in regulating the body's rate of metabolism. Hypothyroidism occurs when the thyroid gland produces less hormone than normal. 95% of hypothyroidism is caused by one of two diseases: an immune mediated thyroiditis or idiopathic thyroid atrophy. The former disease is the most common cause of hypothyroidism and occurs when the dog's immune system attacks the thyroid tissue. In idiopathic thyroid atrophy, normal thyroid tissue is replaced by fat tissue. With either cause, the result is decreased production of normal thyroid hormones by the thyroid gland. Other less common symptoms include: thickening of the facial skin ("tragic facial expression"), abnormal function of nerves causing non painful lameness, dragging of feet, incoordination, and head tilt, infertility in both males and females, decreased tear production in the eyes, or fat deposits in the corneas. 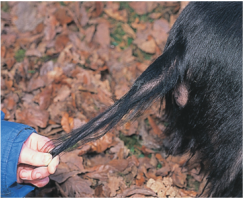 Hairloss often includes the tail and is referred to as a "rat tail" appearance. There are many skin conditions or hormonal changes that can cause similar symptoms, so hypothyroidism has to be diagnosed using a blood test. If the thyroid hormone level is normal, but symptoms suggestive of hypothyroidism are still present, then more advanced testing may be required. Hypothyroidism is generally easily manageable. The disease is treated by providing the dog with a thyroid supplement to replace what the body is not producing enough of. This supplement is typically available as an oral pill given twice daily. Hypothyroidism is not curable, however- if supplementation is stopped then the thyroid level dips and symptoms return. Periodic blood testing is required to insure that the proper dosage is given (if too little supplement is given- the symptoms will not resolve; if too much supplement is given- excess thyroid symptoms are seen: hyperactivity, increased appetite, increased drinking and urinating, vomiting, and weight loss).